After purchasing Uticom’s Anti-Theft Brackets for Sign Installation, you’ll notice that the brackets have an interesting looking bolt for attatchment. The bolts are stainless-steel one-way bolts, whicn means that they are unable to be removed (after installation) with just an ordinary flat-head screwdriver. This is no accident, we designed our brackets this way to ensure the utmost security for our signs. Uticom Systems, Inc. introduces a revolutionary tool in our line of anti-theft products. The U1902S-TOOL-BIT is a versatile screw-driver that is sold with 7 interchangeable heads, including our U1902-BIT or U1902-BIT-1024 bits. These unique bits are needed to remove the one-way bolts that were used in installation of your signs, with your new anti-theft brackets. Setting up the brackets can be done by a normal flat-head screwdriver, but removal can only be done by our U1902S-TOOL-BIT. If you already own a interchangeable screwdriver, you can purchase the bit heads separately. Often confined space work goes unmarked, which could potentially lead to a hazardous liability. If a confined space work area is left unmarked, it has a higher probability of being fallen into. Uticom Systems, Inc. has developed a confined space cover sign to prevent unwanted liability surrounding a manhole. Our cover sign is useful for any area that meets the following three criteria: (1) the space is large enough for a person to enter it, (2) has limited or restricted means of entry or exit, and (3) the space is not designed for continuous occupancy. The sign increases confined space safety and reduces the risk of falling or unauthorized entry into a manhole. Our new cover sign is durable and easy to install. Place two standard safety traffic cones are on either ends of the sign for increased visibility of the confined area. It is manufactured from a 1/8” x 18” x 36” piece of sturdy, reflective polycarbonate. The sign is also availabnle as a high strength label that is to be applied to a piece of strong plywood on site. 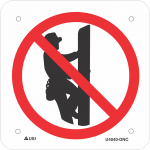 Uticom’s new reflective, “Do Not Climb” pole tag is designed to provide a clear indication when a pole is unsafe to climb. Traditional pole tags often fade or break easily. Uticom uses road sign printing technology to create a tag that will remain legible for 25-30 years. Contact graphics@uticom.net or your local representative to obtain samples and additional information. On numerous occasions, power lines are indistinguishable during the night time or hazardous conditions. Thus, making it difficult for them to be seen by pilots or unmanned aircraft. Uticom Systems, Inc. offers a highly-visible, durable and cost effective way to identify line circuits. Our 8-position, polycarbonate line markers are ideal for areas, such as: construction/ indsutrial sites, marinas, airports, crop dusting, etc. Our U2817YBHI-T series digits allow the markers to be exceedingly visible at all times of the day. Furnished with a high-strength clamping mechanism, the markers can be easily installed using one of our horizontal hot sticks, and will withstand high winds. Uticom Systems, Inc. introduces a safe, secure and efficient way to mount signs to standard chain link fencing. The Anti-Theft Brackets are manufactured from Nylon 6/6 and feature all stainless steel hardware. The lock-on feature allows for secure and safe installation to the fence. The Anti-Theft 5/16” bolt can be tightened using a standard flat-head screw driver, but requires special tooling for removal. Brackets come in packages of 10, or boxes of 100 and 500. Uticom also offers Anti-Theft Brackets for additional posts, poles and fence types. In many cases, signs are installed on substation fences using nylon cable ties or other forms of non-secure methods. Uticom Systems, Inc. introduces a safe, secure and efficient way to mount signs to high security mesh substation fencing. The USG-S-8 Anti-Theft Brackets are manufactured from zinc alloy. The locking feet allow for secure and safe installation to ½”-1 ¾” mesh fencing. The Anti-Theft 0.8” bolt can be tightened using a standard flat-head screw driver, but requires special tooling for removal. Brackets come in packages of 10, or boxes of 100 and 500. Uticom also offers Anti-Theft Brackets for additional posts, poles and fence types. Uticom Systems, Inc. introduces new polycarbonate signs to protect substations from problems caused by small, unmanned aircraft. This product is an angled sign that provides both aerial and ground-level visibility. All signs meet current ANSI standards for design and content. Constructed from virtually unbreakable, non-conductive polycarbonate material, Uticom’s aerial drone sign has an exterior durability of 20-25 years. Reflective drone signs are also available. The signs include Anti-Theft Brackets for safe, secure and efficient installation. Uticom’s Embossed Reflective Pole Maring System is durable, highly visible and easy to install. This system offers an expedient method of identifying the correct pole or piece of equipment in harsh evironments. The embossed “slide-in” aluminum markers are manufactured according to the 3MTM matched component system, which is the same silk screen process used to manufacture road signs. Square markers allow for horizontal or vertical installation. Additional options include: 5-11 positions, custom colors, kit form, pre-assembled and supplemental adhesive backing. Uticom Systems, Inc. now offers Maintence Repair ID Tags. These chemical, water and abrasion resistant tags are superior to standard cardboard tags. They are durable, tear resistant and come with eyelets for a pull out rating 50 times stronger than traditional tags. Uticom’s Custom Maintence tags can be ordered with various options to suit your company’s specific needs. They come ready for installation with high strength acrylic adhesive that adheres to all surfaces. The tag features a UV resistant, self-laminating cover that increases the stability and legibility in a UV environment. The tags can be packaged with various attachment devices, including cable ties and nylon string. Standard packages contain 25 tags. Uticom Systems, Inc. now offers a white polyethylene plastic folding sign frame and construction label. Each sign is created from high-visibility reflective material and can be personalized with a company logo and specific substation site information. Uticom’s folding signs can provide clear, complete and easily accessible data for substations, including a durable weatherproof PVC tube for storing emergency information. Built with maximum durability and long term sturdy construction, these signs are ideal for harsh environments and weak cell service areas. The folding signs come in three safety colors: white, yellow or orange. Each sign comes with 2 paint pens and 12 weatherproof plates to record variable information, such as contact names or numbers. The plates are provided with a UV resistant self-laminating cover and feature a removable adhesive backing.